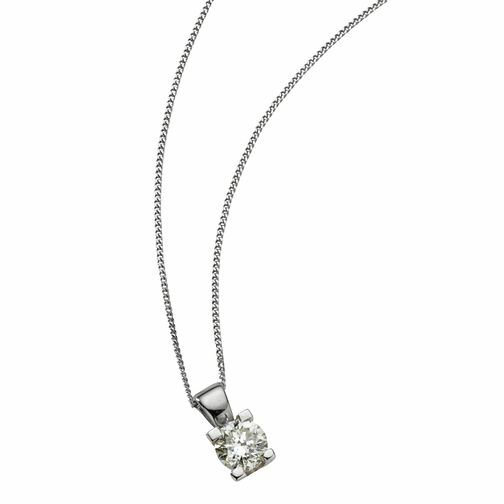 18ct white gold pendant featuring a brilliant cut diamond makes an ideal gift to show how much you care. The Forever Diamond has a unique flower cut made up of 73 facets, the result is exceptional sparkle and radiance. Each Forever Diamond has been independently certified by the GSI for colour, clarity, carat and cut. Its your guarantee of quality and beauty. 18ct White Gold 2/5 Carat Forever Diamond Pendant is rated 5.0 out of 5 by 1. Rated 5 out of 5 by Anonymous from Excellent gift The gift when down a treat. She is still smiling a week later. Diamonds really are a girls best friend.